If I had to describe this veritable tome of a book in one word, I’d have to say that that word is INTENSE. 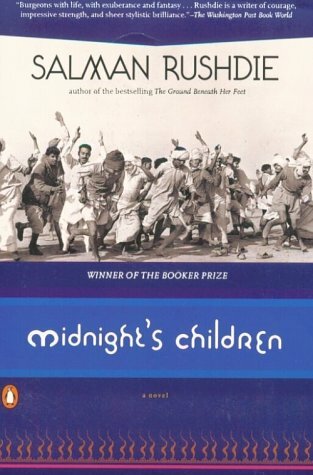 I’ve read Rushdie in the past — Haroun and the Sea of Stories and The Satanic Verses — and while these texts were whimsical and dense (respectively), they were nothing compared to Midnight’s Children. In many ways, I feel like I missed a lot of the underlying meaning due to my shallow understanding of India’s history. The knowledge I do have about India from 1947 on is enough to have given me a basic understanding of the key historical figures and events in the novel and prevent overwhelming confusion, but I’m still left with one thought on my mind: wow. Rushdie’s ability to weave words together and create a magical world within our own still amazes me. Okay, so here are my thoughts on the novel. The narrator and protagonist, Saleen Sinai, was not the most ideal narrator for a reader like me because of his tendency to provide vague details about the future only to snap back to the present and continue on chronologically with the story. In some ways, it felt like the foreshadowing technique Rushdie was using was unnecessary in that you had to read it, but it didn’t advance the story. However, I have read enough Rushdie to trust that there is a reason for this — a purpose that this storytelling style is working toward — and now I just need to think about it and try to make some sense of this technique. So far, I haven’t gotten that far. On another hand, Saleem’s relationship to India presents an interesting basis for the novel. The fate of the Midnight’s Children makes a strong statement that I can’t quite unravel yet, but I have a lot of theories. I must admit that I really wish Rushdie had spent less time on Saleem’s parents’ generation and more time on the Midnight’s Children themselves. Of course, that’s just my obsession with “magical realism” talking — I always prefer the more interesting to the flatly realistic (although I don’t think you could actually call the other parts of the novel “flatly realistic” either) — but even without the more unusual elements, the novel was an interesting interpretation of historical events through a somewhat magical story. This is where my lack of familiarity with Indian history became a true handicap: I knew Rushdie was making some pretty interesting political commentaries (especially with the India-Pakistan partition politics where Saleem was fighting for Pakistan…and also the part where Saleem lost “radio” contact with the rest of the Midnight’s Children when he left India during his parents’ separation), and I could only really get the basic gist of them but not the more complex implications of these messages. I can see how people would argue that this novel is a counterpart to The Satanic Verses in that it’s very much about India and what it means to be Indian in a newly-decolonized India, whereas The Satanic Verses is very much about what it means to be Indian in England (and hybridity and all that). I’m looking forward to rereading The Satanic Verses soon.